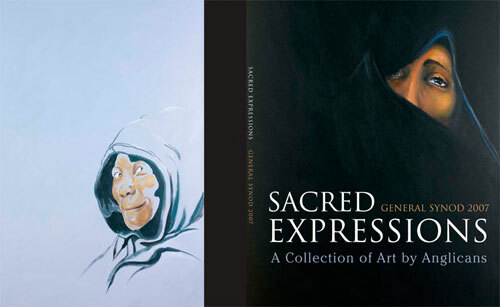 " 'Sacred Expressions' is an initiative of the Worship Committee of General Synod 2007 and Anglican Video. The goal of this initiative is to showcase the work of Anglican Artists from across Canada at the next General Synod, to be held in Winnipeg in June 2007. "Digital photographs of the art work that is selected by the Committee will be shown on a large screen throughout the meeting to some 400 Anglicans and visitors. The group seeks submissions in every medium – painting, sculpture, drawing, ceramics, quilt-making, fabric art, even photographs. Only digital photographs of the work will be featured. The actual piece of work does not need to be submitted.
" 'Draw the Circle Wide… Draw It Wider Still', the theme for General Synod 2007, incorporates concepts of inclusivity: language, race, culture, theology and the dignity of all people. The circle, with Christ as its centre, can be infinitely wide and draws all to Christ. The circle, a symbol of creation and life, is significant to Indigenous people representing healing, sharing and teaching. The inner circle, the Medicine wheel, contains the words of patience, humility, hope and respect. The inner circle shows how we need to be with each other for the circle to be wider. The circle never blocks anyone out and we continue to learn as the circle goes round, ever widening. We hope that graphic representation of the theme can be an open circle, so that the Church is never seen as closed but open and inclusive of all."